This manuscript is named after Eadui Basan, one of the most accomplished scribes of the 11th century. He was a monk of Christ Church, Canterbury, and wrote a number of books apparently destined for other monasteries, as well as books and documents for his own. 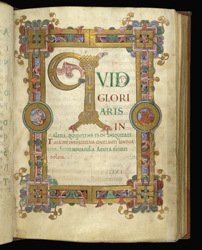 In addition to having some of the most beautiful handwriting of Anglo-Saxon England, he was probably also a skilled artist, responsible, for example, for the miniature in the present manuscript. The 150 Psalms found in a medieval Psalter are often divided into groups in various ways. One early method was simply to divide the book into groups of 50 psalms, at Pss. 1, 51, and 101. This page marks the start of Psalm 51. The decoration is slightly less lavish than at Psalm 1, but here there is the added feature of evangelist symbols: the Ox of St. Luke and the Eagle of St. John.